Disposable Cameras from Kodak, Fuji and More: Convenient one time use cameras with built-in flash and preloaded with quality film. Looking for all-in-one convenience and high quality? 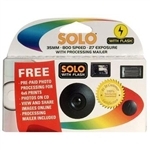 Our line of disposable cameras offer the features you're looking for; from pocket sized convenience to built-in flashes, high definition film, zoom capability, water proof housings and more. Take superb High Definition photos with our new IMAGE HD 35mm single-use camera. The QuickSnap Flash 400 camera features a compact body and comes pre-loaded with Fujicolor 400 speed film. This One-Time-Use camera produces very sharp pictures and features a 10-foot built in flash. The QuickSnap Flash 400 camera is fun & easy to use, and is great for taking pictures indoors or outdoors. The continuous flash switch makes it easier to take multiple shots, letting you concentrate entirely on the pictures! Our 35mm format QuickSnaps contain 27 exposures. Let your guests help you capture memories from your special day with this simple-to-use 35mm disposable camera. Ready to Use. Point, Shoot & Download! Experience single use camera convenience without processing fees or time. All of the benefits of a single-use camera are now in digital format! Works like more expensive digital cameras but without the need to charge a battery or buy memory cards. Take it wherever you'd be afraid to risk your expensive camera. Protect your expensive camera from the elements during indoor and outdoor events. This camera provides a great overall value when compared to the extra cost of film processing and prints. The simple camera design allows you to “point and shoot” and it's fast and easy to download images directly to your computer. Looking for a camera made just for you? Many of our models are available with custom branding and some can even be completely customized.